The second largest city in eastern Germany (and formerly the GDR) after Berlin, and also my personal second favourite one in the east. With regard to dark tourism, it's mainly of interest due to its role in ending the communist era (and the GDR). More background info: Leipzig is good at being second. Despite it being slightly larger than nearby rival city Dresden (both have around half a million inhabitants), it was the latter that was chosen as the capital of the new Free State of Saxony after Germany's reunification. In terms of tourism, too, Dresden is usually regarded as the more attractive place of the two, mainly thanks to its grand (restored) Baroque architecture. And with regard to dark tourism Dresden may also have the edge overall, with a somewhat wider scope and higher-ranking attractions. However: it was Leipzig that was the epicentre of the Peaceful Revolution in Germany in 1989, which facilitated the demise of the GDR and eventually led to the fall of the whole Eastern bloc. So in that sense Leipzig can be regarded as the historically more important of the two cities, at least as far as more recent history is concerned. It was in Leipzig that the now legendary “Monday Demonstrations” started (finally a First!) and where they attracted the largest numbers. It was also here that the risk of a “Chinese Solution” was felt most acutely (that's a reference to the Tiananmen Square massacre in Beijing in the summer of that same year), but it was also where the state security forces decided not to cross that line. After gaining its unstoppable momentum, the “revolution” eventually led to the storming and occupation of the city's own Stasi HQ (secret police) – see Runde Ecke. Obviously, Leipzig's history goes back far beyond the GDR. Earlier, the region was, in 1813, the theatre of the “Völkerschlacht” (literally 'battle of nations/peoples', but also known in the English-speaking world simply as 'Battle of Leipzig') between the armies of Napoleon of France and a coalition of Prussian, Russian, Austrian and Swedish forces. The latter managed to defeat the Napoleonic troops, which in turn spelled the beginning of the end of the egomaniacal French emperor's reign. Having involved well over half a million soldiers, it was then the largest battle in history, until World War One broke all such records just over a century later (see also below). Leipzig was greatly shaped by the industrial revolution. The most visible evidence of this is the city's gigantic train station, constructed as a hub of the fast-developing Prussian and Saxon rail networks. But Leipzig also attracted plenty of industry proper, including continental Europe's largest cotton spinning mill (now a cultural centre). In WWII Leipzig was also the target of Allied bombing, but it was spared the fate of its rival neighbour Dresden of near total destruction. 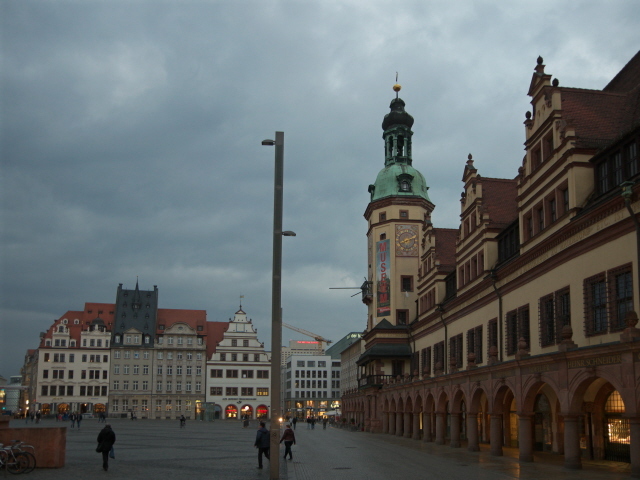 Instead, Leipzig suffered more patchwork damage, though still on a significant scale. Towards the end of the war, the city was initially liberated by troops of the USA, on 18/19 April 1945. Yet Leipzig was handed over to the Soviet Union the following July, in accordance with the pre-decided occupation zones of the victorious Allies. That way, the city ended up a part of the GDR. During that time Leipzig again became an important economic and academic centre. The famous Leipzig Messe (trade fair) developed into one of the most significant such events/venues in the eastern economic world. Since German reunification, a lot of redevelopment has taken place, with some losses, some refurbishment and some new additions. In general, Leipzig is again a bustling metropolis, an important economic centre – but not yet with the same degree of gentrification that has plagued many parts of Berlin in recent years. There's still some pride in Leipzig's historical role in bringing about the reunification of Germany. In this context Leipzig is sometimes referred to as a 'hero city' (in loose and perhaps somewhat tongue-in-cheek allusion to the Soviet title of the same name that was awarded to several cities that had played significant roles in WWII, such as Kiev, Minsk, Murmansk or Volgograd). In addition there's the Zeitgeschichtliches Forum Leipzig (Leipzig Forum of Contemporary History), a branch of the Haus der Geschichte in Bonn (cf. also Life in the GDR Museum in Berlin). This Leipzig branch has a permanent exhibition about the history of the GDR from the beginning of the Cold War to the collapse of the Eastern bloc and the peaceful revolution in the GDR and subsequent German reunification. It's located in the very heart of Leipzig, right next to the northern end of the Mädlerpassage with Auerbachs Keller (see below), at Grimmaische Straße 6. Opening times: Tuesdays to Fridays 9 a.m. to 6 p.m., on weekends and public holidays from 10 a.m., closed Mondays; admission free). Out in the open air information panels about the Peaceful Revolution are dotted around the city at various points of significance, especially around the ring on which the large marches in October and November 1989 took place during the most crucial phase of the protests. Not all of Leipzig's dark history is related to the GDR only. Before then there was of course WWII and the Third Reich period. One striking monument related to that time commemorates the destruction of Leipzig's Grand Synagogue by the Nazis in 1938. The spot is now marked by an area filled with 140 empty bronze chairs – intended to underscore the absence of the building that once stood here. There are also a couple of memorial plaques. The nature of the memorial is a bit reminiscent of that on Krakow's square pl. Bohaterow Getta that commemorates that city's Jewish ghetto during the Nazi occupation of Poland. Another key attraction of Leipzig with a dark connection that goes back even further is the gigantic “Völkerschlachtdenkmal”. This is in fact the tallest war memorial in Europe, at a height of over 300 feet (93m). It commemorates the 'Battle of Nations', in which Napoleon's army was defeated in 1813 (see above). The monument to honour the over 100,000 dead that this battle cost was only begun in the late 19th century and was finished just in time for the centenary of the battle. Ironically it was only the following year that WWI broke out, which quickly exceeded the bloodiness and deadliness of the 1813 Battle of Leipzig by far. 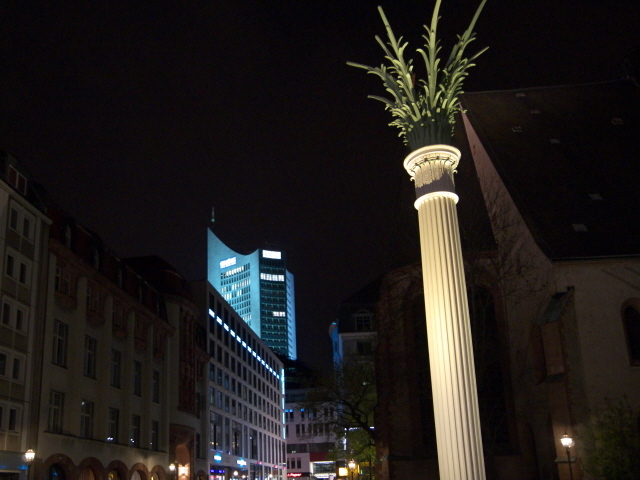 The monument is located a bit out of the city centre, some 2.5 miles (4 km) to the south-east but can easily be reached by public transport (by fast regional train S1 southbound to “Völkerschlachtdenkmal”, or, a bit slower but getting you closer to the actual monument, by tram lines 2 or 15 from the ring/central station). There is also an exhibition, entitled “FORUM 1813”, about the battle and its historical context. Opening times: daily from 10 a.m. to 6 p.m. (from April to October , in winter only to 4 p.m.), admission: 8 EUR. The Völkerschlachtdenkmal has also long been one of the main venues of a different kind of dark: the annual “Wave-Gotik-Treffen”, one of the largest and longest established specialist festivals of gothic music (& dark fashion too) . Locations: Leipzig is quite conveniently located in the heart of the southern half of eastern Germany not far from Dresden, ca. 60 miles (100 km) to the south-east, or Berlin, which is ca. 90 miles (150 km) to the north. Access and costs: fairly easy to reach and not too expensive. Details: Thanks to its rather central location, getting to Leipzig is fairly easy, especially by train, but also by car (finding parking isn't quite as much of an issue here than in other European cities). You could even fly in: Leipzig shares an airport with neighbouring Halle, but there aren't that many useful connections (though currently there are a couple of international flights to London Stansted, Vienna and even Moscow.) Going overland is probably best. Getting around in Leipzig is also fairly easy. The centre of the city is small enough to be comfortably walkable. Only for things as far out as the Völkerschlachtdenkmal may public transport really be necessary. There is a good network of trams and buses. The most recent addition (opened in 2013) is a regional train (S-Bahn) service using a new tunnel under the city to provide fast and easy access from north to south. Accommodation can be still found comparatively cheaply here, and even the very top end is nowhere near as expensive as it would be in other major cities. As for food and drink, the range of restaurants in Leipzig now includes various ethnic options on top of typical German fare. Local specialities include the vegetable stew Leipziger Allerlei and a kind of sweet pastry called Leipziger Lerchen. A quaffable local speciality is an ancient beer style that was reinvented here still during the GDR era: it's called “Gose”, a sour brew similar to some Belgian Lambic styles (esp. their own Geuze). Saxony is also one of Germany's most interesting but smallest wine regions, so the opportunity to try some of those when in Leipzig shouldn't be missed. 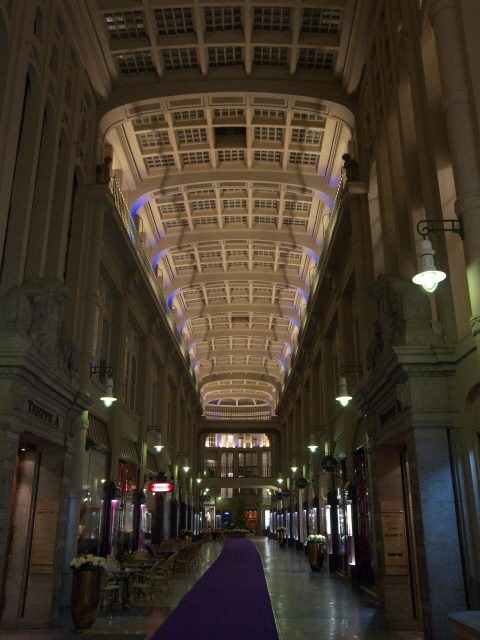 Time required: To see only the dark bits, a single day in Leipzig may just about suffice, but the city deserves at least a day or two longer for explorations beyond just that. Combinations with other dark destinations: Nearest to Leipzig, and in fact run by the Leipzig association that is also in charge of the “Runde Ecke”, is the former Stasi bunker near Machern, about half an hour's drive from the centre of Leipzig. Within fairly easy reach from Leipzig to the south-east is its big rival city of Dresden, which is also home to a good set of dark attractions. In the other direction, to the south-west, the cites of Erfurt (see Topf & Söhne) and Weimar (a good base for visiting for Buchenwald) are a similar distance away. Even Berlin is quite easily reached from Leipzig, especially by train, with plenty of connections, taking only around 60-90 minutes. Combinations with non-dark destinations: Leipzig may not be on a par with tourist hotspots such as Berlin and Dresden, but it does have some mainstream attractions too. For instance, there's the Leipzig Zoo, one of the best and most modern zoos in the world today. It is truly impressive, especially for its Gondwanaland. This is a huge hall with a translucent roof and façade in which a hot and humid tropical climate is recreated (it's in fact the largest such structure in Europe). So here you can watch sloths, giant otters, tapirs and other jungle-dwellers in as near authentic an environment as is possible in central Europe. Leipzig's connections with the world of literature, in particular the celebrated Johann Wolfgang von Goethe (cf. also Weimar), are heavily alluded to in the famous Auerbachs Keller, today a rather touristy restaurant, but back in Goethe's time a wine cellar/bar. The place prominently featured in Goethe's major work “Faust” (claimed by many to be amongst the greatest works of German literature). So it's no wonder that this connection is being milked here. Outside the entrance even stand sculptures of the legendary Dr. Faustus and Mephistopheles (i.e. the Devil). Another important aspect of Leipzig's cultural offerings is in music, not just through the Dark Wave Gothic Festival (mentioned above) but also in classical music. This has in fact a long tradition. 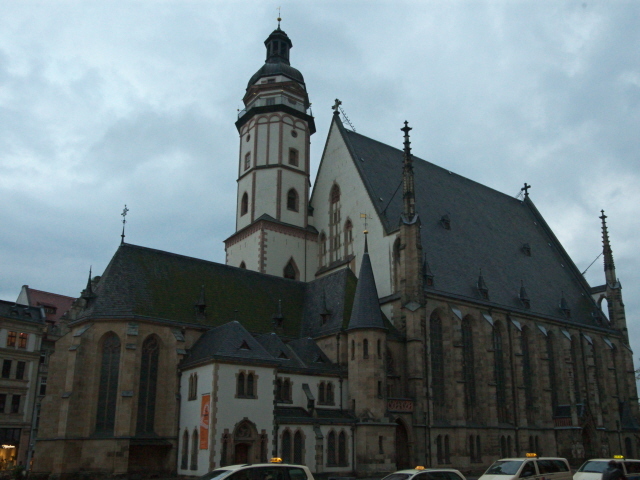 Most famously, the great composer Johann Sebastian Bach spent his last 27 years (1723 to 1750) in Leipzig, where he was also the director of the long-established Thomanerchor, the Choir of St. Thomas, at the Thomaskirche, one of the city's two main churches (the other being the Nikolaikirche already mentioned). Bach wrote many of his most famous compositions during his time in Leipzig. He is buried inside the Thomaskirche. Still alive and active today in Leipzig is one of Germany's most prestigious orchestras, the Gewandhausorchester (named after their concert hall – see below). Leipzig also has its fair share of pretty impressive period architecture, mostly from the 19th and early 20th centuries (“Gründerzeit”). But if size matters then there's one that beats the lot … big time: the Hauptbahnhof, the central train station. This is a true behemoth of a grand imperial-era functional building. By floor space it is the largest station in the world. Its 19 platforms are accessed through not one but two gigantic portals. The concourse running the length of the head of the platforms is nearly 1000 feet (300m) long – though these days its soaring height is interrupted by the addition of a shopping mall and fast-food outlets (a typical development familiar from many a formerly grand train station in Europe …). 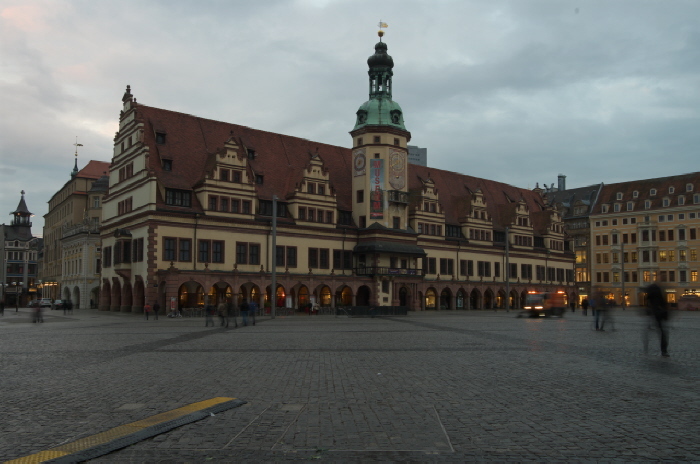 Several significant examples of modernist architecture can be seen in Leipzig as well. One is the Gewandhaus concert hall, completed in 1981. It's quite an architectural statement, in a rather boxy brutalist style that may not appeal to everybody. But its internal merits are undisputed. The concert hall is considered to have amongst the best acoustics of any such structures in the world. The new building replaced a predecessor that was badly damaged in WWII and had stood as a ruin for over two decades before being demolished in 1968. The GDR-era development of the University of Leipzig (see above) also gave the city its literally most outstanding modern edifice, the ca. 500 feet (150m) tall so-called City-Hochhaus (city high-rise), built between 1968 and 1972, and standing right next to the Gewandhaus. The skyscraper is a massive brutalist intrusion into the city's skyline, but I really like it for its Soviet-like modernist-optimist design (its triangular footprint was allegedly intended to allude to an open book). However, the university had to move out in the 1990s and the building was gutted, stripped and completely refurbished. It is now a mixed-use office block. The formerly super-modernist aluminium cladding unfortunately fell victim to the refurbishment. It's now clad in grey stone slabs instead. Yet there is another GDR-era example of modernist architecture whose metal-clad design of the 1960s survives and was even refurbished/recreated in recent years. It's the iconic former “Konsument” department store with its flamboyant silver cladding of alternating concave and convex square metal tiles. Again, it's not loved by everybody. It depreciative nickname in Leipzig is the “Blechbüchse” ('tin can'). Interestingly, the modernist façade is in fact the only thing that's original here – these days it is attached to an all-new building. When the old “Konsument” department store bearing this façade was slated for demolition to make way for a new shopping mall complex, it caused an outrage. The bone of contention was in particular that underneath the silver modernist façade an older structure of an early 20th century stone façade was hidden. Now the question was in which way the replacement building should be reconstructed – in the GDR modernist way or in the previous more classicist style. At times a compromise of doing both, at the opposite ends of the complex, was suggested, i.e. retaining the stone façade and moving the modern silver façade to the other end – plus the all-new mall in between. But in the end only a small segment of the old stone façade was kept, but is now hardly visible, while the GDR-era style was recreated in its full glory. For this the original metal tiles that been put in storage for the duration of the reconstruction were mostly reused. You can imagine that quite a few people were not happy with that solution. But, frankly, I see it as a cool counter-example to the post-GDR revisionist trends in architecture, of which the new Berlin “Stadtschloss” ('city castle'') that replaces the former GDR's parliament building, the Palace of the Republic, is the most drastic example. OK, a better compromise may have been possible in Leipzig as well, but if I had to choose, I'd always have made the same decision to keep the silver modernist façade – mainly because that style is in fact getting rarer, while classicist turn-of-the-century (I mean 19th to 20th) buildings are comparatively commonplace in the city.